What is a New York Living Will? New York Living Will: What Is It? A New York living will is a legal document that you complete in order to explain your wishes related to medical care. 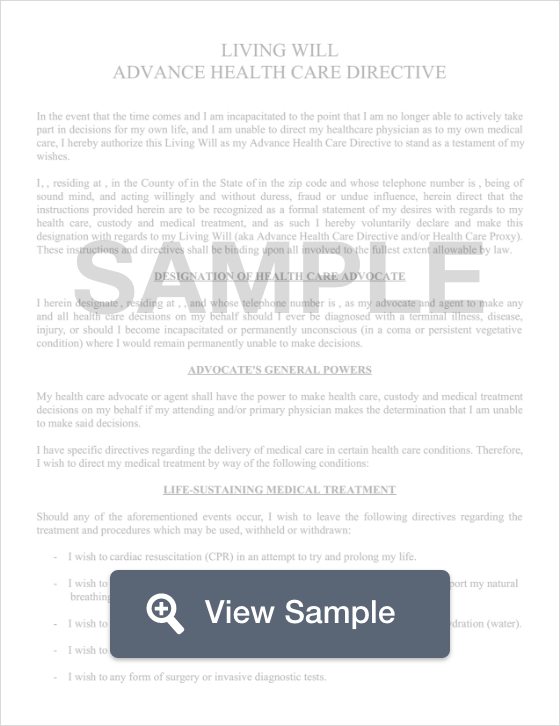 A New York living document is consulted by healthcare providers if you are not able to make your own medical decisions. This document is also used to an agent to make decisions on your behalf. New York has specific laws about who can and cannot act as your agent. A New York living will must be signed in front of two witnesses. Your witnesses cannot be under 18, named as your agent, or be the person who signs on your behalf if you are unable to sign your own name. § 2994-A through § 2994-U: The attending physician must take reasonable steps to ensure that the person who states they are the healthcare agent is actually named as such in the document. If the patient has a court-appointed guardian, the court-appointed guardian may be the individual who also acts as the healthcare agent. A New York living will, more commonly referred to as an advance healthcare directive, only allows you to document your future wishes related to healthcare. For all other wishes, use a New York last will and testament.